Antonio Rüdiger (German pronunciation: [anˈto:nio ˈʁy:diˌgɐ]; born 3 March 1993) is a German professional footballer who plays as a defender for English club Chelsea and the Germany national team. He began his career at VfB Stuttgart, representing their reserves in 3. Liga and the first team in the Bundesliga. In 2015 he joined Roma, initially on loan and a year later for a €9 million fee. He was signed by Chelsea in 2017 for an estimated £27 million. Rüdiger made his international debut for Germany in March 2014. He was forced to miss UEFA Euro 2016 due to an injury suffered earlier in the season but he was part of the squad that won the 2017 FIFA Confederations Cup. He kept his spot in the squad for the 2018 World Cup. On 23 July 2011, Rüdiger made his debut for VfB Stuttgart II in the 3. Liga against Arminia Bielefeld. On 29 January 2012, Rüdiger made his Bundesliga debut for VfB Stuttgart's first team in a home professional match against Borussia Mönchengladbach, he was replaced by Raphael Holzhauser in the 79th minute of a 3–0 defeat. On 19 April 2013, Rüdiger extended his contract with VfB Stuttgart until June 2017. On 4 May he received a red card in the 74th minute of a 2–0 home defeat against Greuther Fürth. On 1 June, Rüdiger played in the final of the DFB Pokal in a match lost 3–2 against Bayer Munich. He finished his second season in the first team with 24 appearances, plus 4 appearances and 2 goals in the reserve team. On 19 August 2015, Serie A side Roma signed Rüdiger on loan from VfB Stuttgart for €4 million. The clubs agreed on an optional €9 million transfer fee at the end of the one-year contract. On 12 September, he made his debut in a 2–0 away win over Frosinone. On 9 January 2016 he scored his first goal for Roma in the 4th minute of a 1–1 home draw against Milan. He finished his season-long loan to Roma with 37 appearances and 2 goals. On 30 May, Roma officially signed Rüdiger from for €9 million + €0.5m bonuses on a four-year contract. On 9 July 2017, Rüdiger joined Chelsea from Roma for a reported initial fee of £29 million on a five-year deal. He was given the number 2 shirt. He made his debut on 6 August as a substitute replacing Marcos Alonso in the 79th minute in a 4–1 loss on penalties to Arsenal in the 2017 FA Community Shield. He made his Premier League debut six days later in a 3–2 defeat against Burnley at Stamford Bridge. He scored his first goal for Chelsea in the round of 16 of the EFL Cup in a 2–1 win over Everton, and his first league goal was the only one of a home win over Swansea City on 29 November. On 20 October, Rüdiger scored his first goal of the season, opening the scoring in a 2–2 home draw against Manchester United. Rüdiger was eligible to play for Germany and Sierra Leone, his mother's homeland and was a member of the several German national youth football teams up to the Germany U21 team. He made his debut for the German national senior team on 13 May 2014 in a 0–0 draw against Poland. Although he was initially included in his nation's 23-man squad for UEFA Euro 2016, Rüdiger was later ruled out of the tournament due to injury, after tearing the anterior cruciate ligament in his right knee during a training session on 7 June. Rüdiger was part of the German national squad which won the 2017 FIFA Confederations Cup in Russia. He played four matches in the tournament, including the 1–0 win over Chile in the final. On 8 October 2017, he headed his first international goal in a 5–1 home win over Azerbaijan in World Cup qualifying. 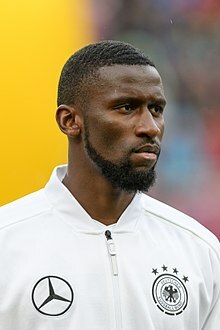 Rüdiger was included in Germany's final 23-man squad for the 2018 FIFA World Cup on 4 June 2018. On 24 June, he picked up for the second group stage match against Sweden as first choice centre-back Mats Hummels suffered an injury, the game ended 2–1 win for Germany. Four days later, he did not play the last group stage match and his side were knocked out by South Korea after a 2–0 defeat. Normally a centre-back, Rüdiger is a versatile defender, who is also capable of playing as a full-back on either flank. In 2015, ESPN described him as a "...tall, quick and athletic defender who is ... comfortable with the ball at his feet", also touting him as an "interesting prospect" who "...has all the necessary physical attributes to become a top-level centre-back." His Chelsea profile also describes him as a "tough tackler" and a "commanding presence in the air." Rüdiger's father, Matthias Rüdiger, is German, while his mother Lily is originally from Sierra Leone. He is the half-brother of Sahr Senesie. In October 2018 he stated that authorities needed to do more to deal with racism in the sport. As of match played 19 November 2018. Germany score listed first, score column indicates score after each Rüdiger goal. ^ "FIFA World Cup Russia 2018: List of players: Germany" (PDF). FIFA. 15 July 2018. p. 12. Retrieved 5 October 2018. ^ a b "Antonio Rudiger". Chelsea F.C. Retrieved 5 October 2018. ^ "Arminia Bielefeld – VfB Stuttgart II 1:2 (1:0)" (in German). German Football Association. 23 July 2011. Retrieved 27 January 2012. ^ "Stuttgart vs. Borussia M'gladbach – 29 January 2012 – Soccerway". uk.soccerway.com. Retrieved 7 November 2017. ^ "Antonio Rüdiger extends contract with VfB". vfb.de. VfB Stuttgart. 19 April 2013. Retrieved 19 April 2013. ^ "Stuttgart vs. Greuther Fürth – 4 May 2013 – Soccerway". uk.soccerway.com. Retrieved 7 November 2017. ^ "Bayern München vs. Stuttgart – 1 June 2013 – Soccerway". uk.soccerway.com. Retrieved 7 November 2017. ^ a b c d "Germany – A. Rüdiger – Profile with news, career statistics and history – Soccerway". uk.soccerway.com. Retrieved 6 November 2017. ^ "Hamburger SV vs. Stuttgart – 20 October 2013 – Soccerway". uk.soccerway.com. Retrieved 6 November 2017. ^ "Roma complete Rüdiger signing". asroma.it. A.S. Roma. 19 August 2015. Retrieved 19 August 2015. ^ "Frosinone vs. Roma – 12 September 2015 – Soccerway". uk.soccerway.com. Retrieved 6 November 2017. ^ "Roma vs. Milan – 9 January 2016 – Soccerway". uk.soccerway.com. Retrieved 6 November 2017. ^ "La Roma ha esercitato il diritto di opzione per l'acquisizione di Antonio Rudiger" (in Italian). A.S. Roma. 30 May 2016. Retrieved 31 May 2016. ^ "Roma vs. Villarreal – 23 February 2017 – Soccerway". uk.soccerway.com. Retrieved 6 November 2017. ^ "Roma vs. Lazio – 30 April 2017 – Soccerway". uk.soccerway.com. Retrieved 6 November 2017. ^ "Antonio Rudiger: Chelsea sign Roma defender for a reported initial fee of £29m". BBC Sport. 9 July 2017. Retrieved 9 July 2017. ^ Pasztor, David (9 July 2017). "Antonio Rüdiger inherits Chelsea legend's shirt number". sbnation.com. Retrieved 13 August 2017. ^ "Arsenal vs. Chelsea – 6 August 2017 – Soccerway". uk.soccerway.com. Retrieved 6 November 2017. ^ "Chelsea vs. Burnley – 12 August 2017 – Soccerway". uk.soccerway.com. Retrieved 6 November 2017. ^ "Chelsea vs. Everton – 25 October 2017 – Soccerway". uk.soccerway.com. Retrieved 6 November 2017. ^ "Chelsea 1 Swansea 0: Antonio Rudiger the unlikely hero". www.standard.co.uk. Retrieved 29 November 2017. ^ "REPORT: CHELSEA 2 MANCHESTER UNITED 2". www.chelseafc.com. Retrieved 21 October 2018. ^ "AS Roma sign Antonio Ruediger on loan". Archived from the original on 16 April 2016. Retrieved 1 April 2016. ^ "Germany 0–0 Poland". www.goal.com. Retrieved 14 May 2014. ^ "Antonio Rudiger tears ACL in Germany training, ruled out of Euro 2016". ESPN FC. 7 June 2016. Retrieved 8 June 2016. ^ Johnston, Neil (2 July 2017). "Chile 0–1 Germany". BBC Sport. Retrieved 11 January 2018. ^ "Germany 5–1 Azerbaijan". BBC Sport. 8 October 2017. Retrieved 11 January 2018. ^ "World Cup 2018: Mats Hummels says Germany's dramatic win over Sweden could be their turning point". The Independent. Retrieved 1 August 2018. ^ "Toni Kroos brings off late miracle for Germany to stun Sweden". The Guardian. Retrieved 1 August 2018. ^ "South Korea 2–0 Germany: World Cup 2018 – as it happened". The Guardian. Retrieved 1 August 2018. ^ "Rudiger, dall'Inter ai milioni di Conte: la Roma blinda il leader della difesa 2.0" (in Italian). www.calciomercato.com. 10 February 2017. Retrieved 21 October 2018. ^ Nick Dorrington (7 July 2015). "Rising star Antonio Rudiger would be best served by Bundesliga stay". ESPN FC. Retrieved 20 October 2018. ^ "Antonio Rüdiger: "Manchmal musst du volles Risiko gehen"" (in German). German Football Association. 24 February 2012. Retrieved 21 October 2012. ^ a b "Rüdiger, Antonio". National Football Teams. Benjamin Strack-Zimmerman. Retrieved 11 February 2019. ^ "Eden Hazard Penalty Wins Emirated FA Cup for Chelsea". The FA. Archived from the original on 20 May 2018. Retrieved 20 May 2018. Wikimedia Commons has media related to Antonio Rüdiger.